Bob received his Bachelor’s degree from the University of Wisconsin–Green Bay in Outdoor Education and completed his Master’s degree in Applied Sociology at Northern Arizona University. He and his wife and two sons moved to Prescott in 1985. He has spent more than twenty years working in health and human services. He developed the Turning Point Youth Crisis Shelter which continues operations today. Next he began a grant funded position with the Yavapai County Health Department Wellness on Wheels Project. He helped establish PAIRS, an Information & Referral agency to serve the Prescott area, and was responsible for the inclusion of PAIRS (now UWIN) in the Step One Community Center. The program provides a link for area residents to find the health and human services they need. He has served on numerous Nonprofit Boards and assumed leadership roles for many organizations throughout his career in health and human services. Also he taught Sociology at Yavapai College for a decade, until Spring, 2007, and continues to provide consulting for nonprofits in the Prescott area. Bob began his community service career as a VISTA Volunteer at a Crisis Hotline service in Green Bay, Wisconsin. He also served as a Peace Corps Volunteer, serving 2 years in Southern Africa. His particular interest is addressing community systems and bringing diverse people together to work in harmony. Bob has been with Yavapai County Long Term Care since July, 2006. In December 2006, Mildred was honored for her exceptional accomplishments as an Outstanding Volunteer for New Horizons Independent Living Center. Her volunteer experience began at NHILC in 2000 and since that time she has been helping in any and all functions at the center including many of the following endeavors. As a member of the NHILC Board of Directors, she began her service in 2003 and later served as Vice President and also as Acting Secretary. She has been an active member of several Board of Directorsb committees including the Resource Development Committee, the Special Events subcommittee as well as the Recreation and Transportation and Nominations Committees. She participated in the NHILC strategic planning and nonprofit fundraising workshops as well as attending numerous community meetings as an ambassador for NHILC. As an all-around volunteer, she has participated in and helped setup almost every community, social and recreational event since becoming involved. Some of the events include community fairs, craft sales and yard sales, the Annual Nonprofit Stocking Stuffer Bazaar, selling raffle tickets, baking cookies for special occasions, cooking for parties, providing backup office support, helping with mailings and support groups, and wherever there was a need for a extra pair of hands. She helped plan numerous special events including several Thanksgiving and Christmas dinners for our groups, and she always jumped in to help with setup, cooking and cleanup! And she is known for being a good cook supplying cookies and brownies and other goodies that were eagerly devoured by all! As dedicated volunteers, Mildred and Sara, the Greeter dog, were involved in countless social activities, fundraising and public relations events, enthusiastically serving as hard-working helpers during their many years of service. Also she and another volunteer, Mildred Fulton, are known affectionately as the M and M volunteers who help with the monthly Horizon Newsletter by folding, stuffing and stamping, and as cheerleaders at wheelchair basketball and accessible sports activities. With a background as a caregiver and previous volunteer for Meals on Wheels, she has many interests including reading, gardening, cooking, dogs, natural health issues and is an avid rock-hound. Was it mentioned that Mildred is a lady in her 80’s? Her many hours as a volunteer have been priceless and she has been a source of encouragement to many people. Her strong belief in the mission of New Horizons Independent Living Center is demonstrated in her passionate commitment to this agency and to helping people living independently. We honor Mildred for her humor, her spirit of compassion and dedicated service and her long-term commitment as a volunteer at NHILC. She is a spirited, feisty and loyal volunteer who brings much to this agency. In 1993, having moved to a Northeastern state, I was unable to find work in my field as a map draftsman in the small community to which I had relocated. Desperate, I answered an advertisement for a Respite Provider, a position that provides relief for families that care for an individual with a severe disability. I got the job, which proved to be a pivotal point in my life. A new world opened up to me, intriguing, challenging and fulfilling. I soon found myself back in school, eventually earning a degree in Human Potential. I have worked with folks with disabilities ever since that life-changing day in 1993. Beyond the formal education I felt compelled to obtain, rests the irrefutable wisdom imparted to me by the individuals with disabilities I have gotten to know these many years past, wisdom that has proven to be of exceedingly great value. I have learned great respect for people with other than average abilities. I have learned that awareness of individual capabilities, interests, resources and social connections are essential to optimize quality of life for each distinct person. I have learned the stigma of being a devalued person and the terrible oppression of bearing a negative label. Perhaps the most profound lesson I learned is that being different (that is: not average or ordinary) is incontrovertibly acceptable. A disability can strike anyone at any time. We at NHILC endeavor to impart the idea that a disability should not be considered a flaw in the human condition, but rather a distinction in the human condition; an element that makes an individual unique. Some people see through brown eyes, some people see through blue eyes, others don’t see with their eyes but rely on other senses. Some people mobilize with legs, others in a chair; the list of things that makes an individual a unique entity goes on an on. People with disabilities, like all other people, are deserving of equal treatment and full integration within Arizona communities, and everywhere else for that matter. I am pleased to be part of New Horizons Independent Living Center and the vital work we do. 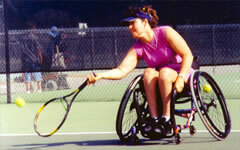 Nannette Oatley, MA, LPC, is a resiliency expert, licensed professional counselor, former radio talk-show host, author, speaker, mother, wife, wellness consultant and the 2001 U.S. Open wheelchair tennis champion. Each of these roles signifies a commendable achievement for any individual; together, they form an extraordinary list of credentials for one person to attain. But when the woman who fits the bill is a sit-down person in a stand-up world, the magnitude of her accomplishments is astonishing. For over 25 years, Nannette’s life has been a living testimony to the power of resilience. She was a former gymnast, dance choreographer, and amateur actress until a broken neck altered her life in 1982. Following her injury, she married and gave birth to three children within three years. In 1989, when her children were five, three-and-a-half and two, she began a single-parent career that encompassed nine years. During that time she completed a B.A. in counseling psychology and then an M.A. in counseling and human services. Nannette is an amazing person – not just for her accomplishments as a ‘sit down woman’ but for her heart-centeredness. (Is that a real word?) She is a testimony to many things! We miss being around her and her wonderful husband!